This is a contradiction! The inter market relationship between Treasuries and stocks has been an inverse one since 1997. 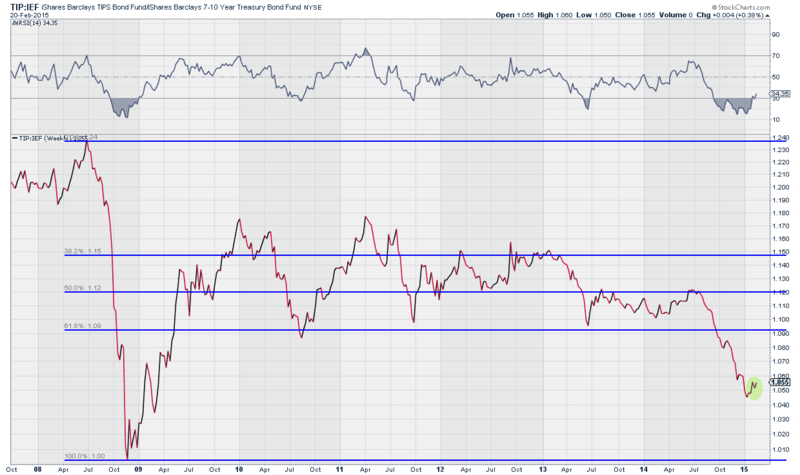 Whenever we have seen this anomaly, Treasuries were portending weakness in stocks. 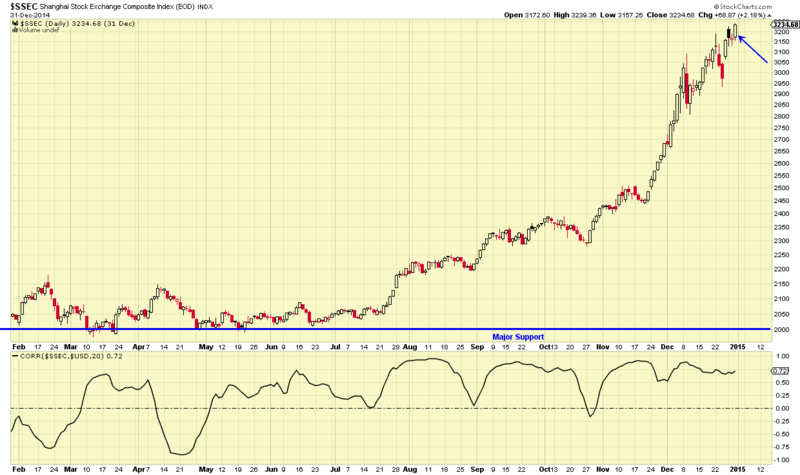 We saw this in early 2011 on a shorter term basis. However, this time we are seeing a sustained contradiction which I expect to continue. 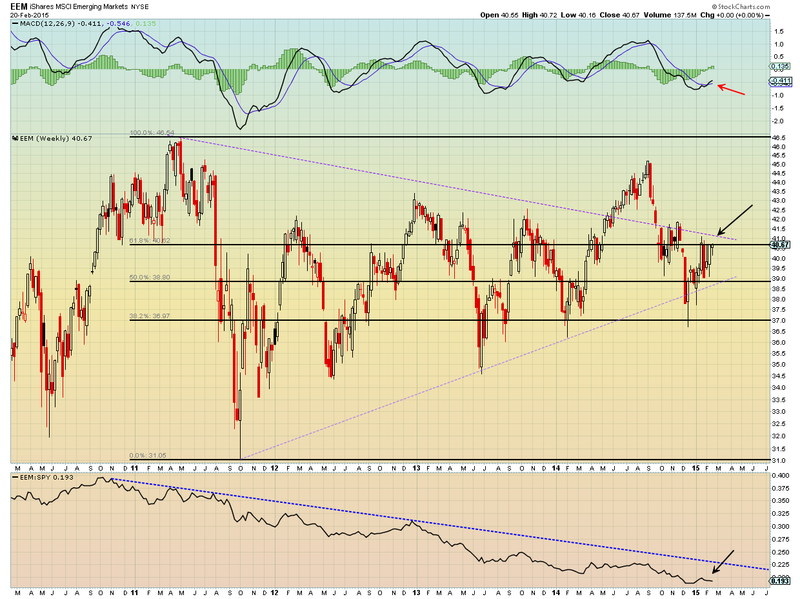 Could Treasuries be wrong this time and stocks right? Anything is possible but the odds speak against it. 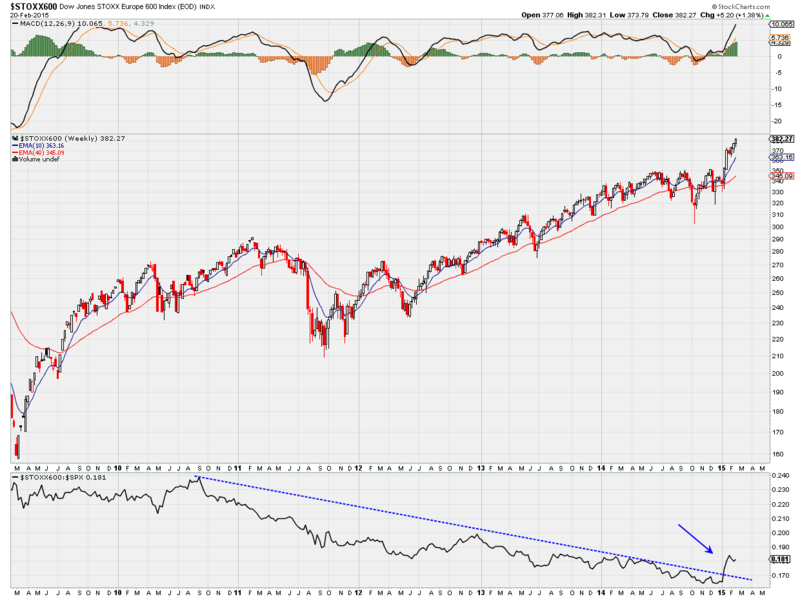 HT +Marc Chandler corrected my statement regarding the inverse correlation between Treasuries and stocks since q997. He rightl pointed out that, based on 26 week correlations, prior to GFC, the correlation was generally positive. 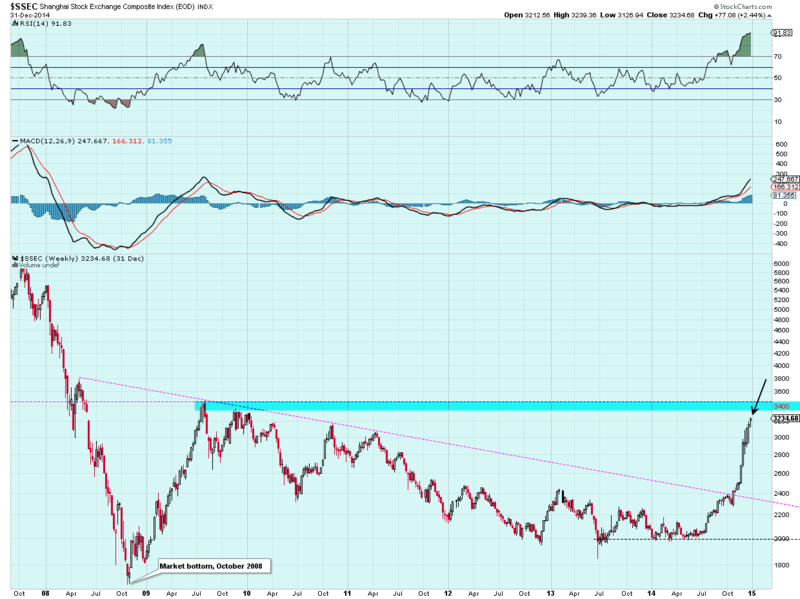 My point was that since the Asian Currency crisis investors have generally fled into Treasuries in volatile periods. Copper, German Bund yields and the US Ten Yr yield surged in tandem on Thursday. This is either the head fake of all time or a clear signal that the global economy strengthening. I've been more bullish than most on stocks and the global economy and this is just another signal we are finally on our way out of the global economic malaise. Europe and Emerging Markets will continue to outperform US equities but the S&P 500 will still be at all time highs by the end of year. In the meantime, we're still in for a bumpy ride as seasonal factors will keep the market choppy through the first part of summer (at least) and issues regarding Greece and ongoing fears of when and how much the Fed will raise interest rates still grip the market. All these, in my opinion, are unwarranted concerns. While I haven't posted a commentary in over six weeks the stock market has experienced volatility not seen in a few years as investors remain fretful of the Fed normalizing interest rate policy, a volatile crude oil market, a "Grexit" or Greek exit from the Eurozone (a farcical drama) and concerns that the US economy might be actually slowing. My post this weekend will be brief but I intend to present a thesis on why we are in the midst of a turn in world economic growth and that global equities will move significantly higher in 2015; perhaps higher than many consensus forecasts on Wall Street. The fact that the ECB QE program may run out of "debt paper" to buy as they are constrained in buying bonds with negative yields. The Eurozone is quickly becoming a negative yield bond market. And this is all good! Because when everyone has concerns the market "climbs the wall of worry" and moves higher. It's when investors get complacent that it's time to watch out. And I will be giving an example of this complacency relating to another matter toward the end of my commentary. The first three concerns I mentioned are actually a double edged sword. Although they are distortions that have been created by central bank manipulation they are also the reason why global growth and equities are preparing to move another significant leg higher in the coming months. In the wake of the 2008 debacle, central banks have inflated risk assets in the hopes that eventually asset prices would spur broader economic growth thru capital investment, thereby generating employment and overall prosperity. Papering over trillions of dollars in lost wealth and debt was an experiment that was forced on central banks. To do nothing would have been to invite a deflationary depression which would have made the early 1930's seem mild. In a post 2008 world the central bank experiment has generated up to this point, only tepid and uneven growth. There are many factors that have contributed to this fact which are outside the scope of this commentary but which I've touched upon is past writings. In my last commentary I stated that, at a macro level, the consuming economies in the West would have to lead us out of this global economic malaise we find ourselves in before we could start to see a significant pick up in economic activity in the developing nations of Asia and the Mid East. Simply, until Emerging Markets and China transitioned into true consuming economies, it was dependent on the West (US & Europe) to pull us out of this low growth, disinflationary to deflationary mire we find ourselves in. I've also specified that with ECB QE being implemented, we would start to see global growth accelerate around mid year. Well the Emerging Market complex seems to be giving us that signal already. Let me explain. I want my readers to notice the correlation coefficient in the panel above the chart. 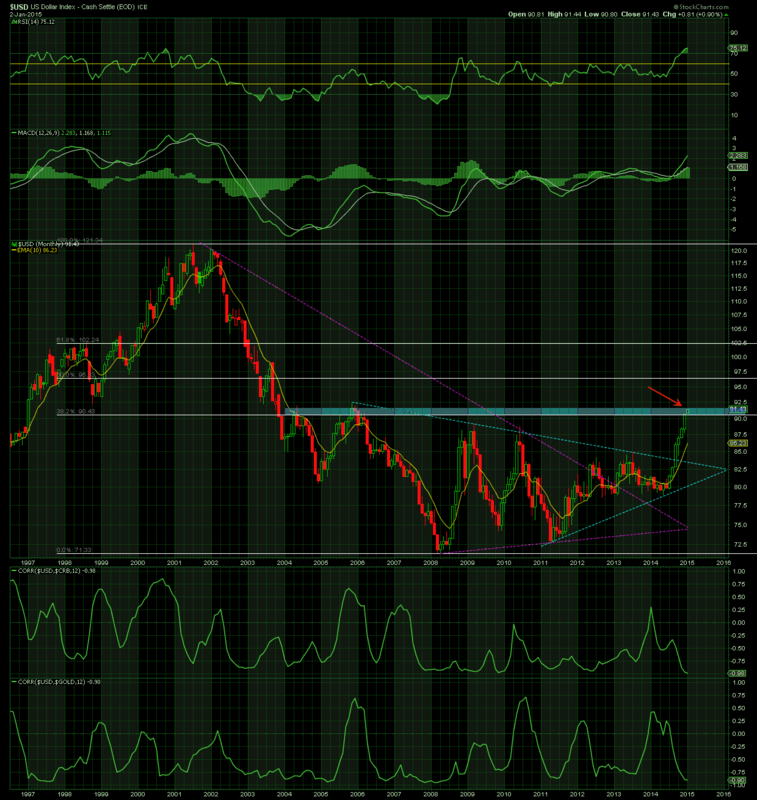 EEM is in the midst of a strong rally while facing a strengthening US Dollar! So much for US Dollar denominated debt being an anchor around emerging market economies! In the chart above, the previous rise in 2014 in which emerging markets rallied with a positive correlation to the Dollar ceased when the Fed officially ended their QE program. Emerging Markets reacted as they had in the past to a strengthening dollar. But now the rise is accompanied by global expectations that the Fed will raise short term rates this year. If this signal persists it can only mean that the market is pricing in true and sustained global economic growth. In a post 2008-2009 world, there is no way that a sustained strengthening US Dollar could coexist with strong Emerging Market growth. The only way this can be occurring is by the economic paradigm changing. Here's another curve ball I'd like to throw my readers. I made a statement above about investor complacency that I'd like to tie in with another situation that I believe may be brewing. 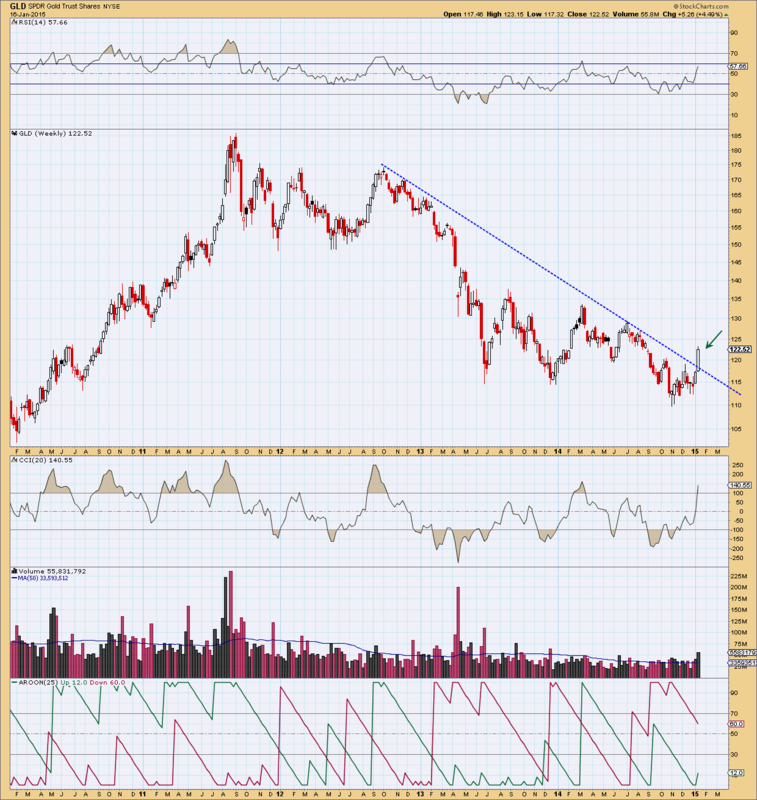 Admittedly, I have to embrace the fact that technically Gold is in a down trend and with the prospect of higher interest rates (even if incremental) there should be more downside pressure on the yellow metal. And the price action in mining stocks do not support a move higher either. However, if the move in Emerging Markets is more than the anomaly I think it is, then in the same technical environment, would Gold not rally in tandem with a strengthening dollar? Some of my friends may giggle that I am even suggesting that a strong Dollar and Gold could be positively correlated but if the move in EM is sustained then inflationary pressures could mount globally as economies in both the developed and developing world start to fire on all pistons. To sum up, with a Federal Reserve tentative about raising short term rates, the ECB and BoJ (Bank of Japan) flooding the global system with liquidity, muted inflationary pressures and expectations and an interest rate environment very conducive to borrowing for capital growth, equities have nowhere to go but higher. A twenty five or even fifty basis point rise in short term rates is not going to ruin the party. Yellen predicates any move on interest rates as data dependent. So, as it stands right now, if the Fed goes this year it will be in September and with only one bump of twenty five basis points. Since my last commentary the market has been pushed to and fro with concerns over a Greek exit from the Euro Zone and with Friday's "agreement" in Brussels it appears that the Greek saga has been pushed back another four months when another day of reckoning will rear it's ugly head. Monday will tell us much regarding the Tsipras' government's resolve to stay in the zone when they submit their list of alternative reform measures to the EU. 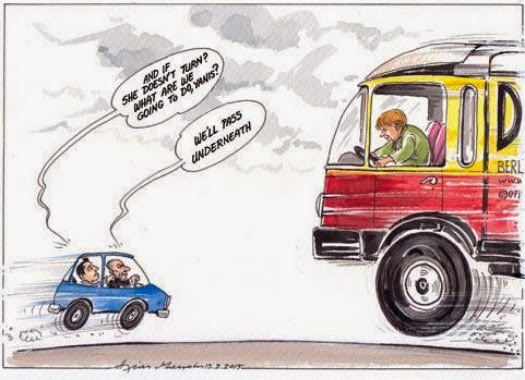 If there's any fudging on the Greek government's part to dodge the general thrust of the austerity measures originally imposed upon them, it will be back to the drawing board once again and more market volatility will result. Still, the market has been very resilient throughout the negotiation saga of the past few weeks and I believe any market moves will be muted. ... which they cannot win and if the ECB withdraws their support from Greek banks it would immediately result in abject destitution for the Greek nation and spawn a humanitarian crisis of huge proportions. Other economic indicators (credit growth and expanding money supply) are giving significant support to international equity and commodity valuations. 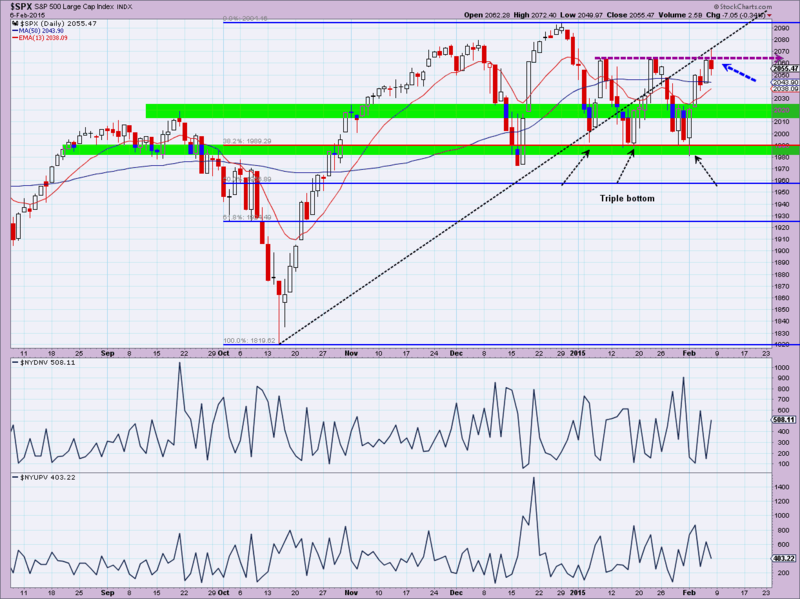 This weekly chart clearly shows the strong bounce in the area I earlier marked as "potential drop zone" and we are now at the top of another resistance area. My thesis on oil's recent bounce in the face of gross oversupply and static demand is market expectations that Europe is now stirring we are going to start to see some measurable global economic growth which will increase demand for oil. This is a weekly chart of the Dow Jones Europe 600 Index, a broad based index of European stocks and I want my readers to notice the price relative chart in the bottom panel. After a long downtrend, European stocks have jumped and are, at least for now, outperforming their US counterparts. I believe this explains, in part, the relatively sluggish nature of the advance of US equities as money flows are starting to move out of the US into continental stocks. This is a weekly chart of the iShares MSCI Emerging Markets ETF (EEM) and the price relative chart to the S&P500 in the bottom panel is showing continued under performance. We do see some glimmers in momentum in the top panel (red arrow) where MACD is undergoing a possible crossover while the ETF itself is snagged on Fibonacci resistance. 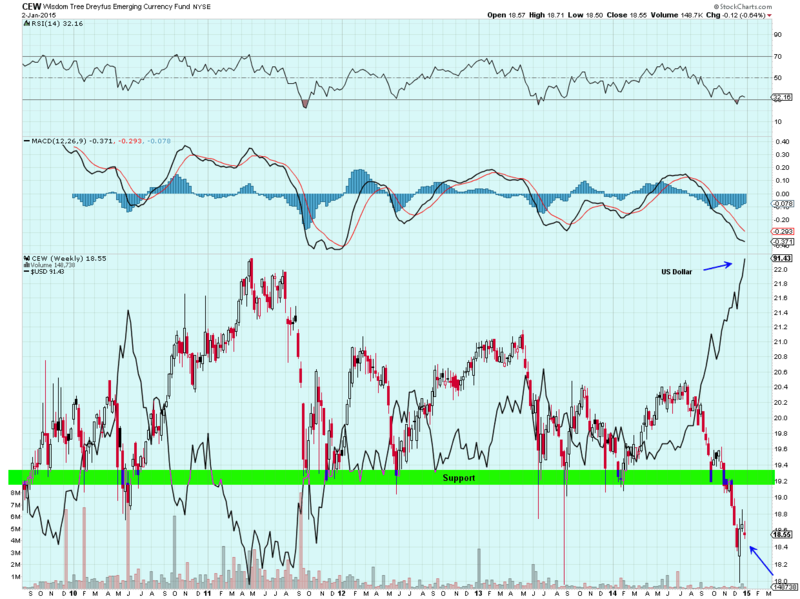 I consider the price action in EEM logical given present conditions in the global economy. I have said more than a few times in past commentaries that, at a macro level, the consuming economies in the West will have to lead us out of this global economic malaise we find ourselves in before we can start to see a significant pick up in economic activity in the developing nations of Asia and the Mid East. Simply, until Emerging Markets and China transition into true consuming economies, it is dependent on the West (US & Europe) to pull us out of this low growth, disinflationary to deflationary mire we find ourselves in. There's much more to say on this topic as I believe that, at a foundational level, global economic challenges are structural in nature mainly based on demographics. However, I neither have the time or the inclination to comprehensively address this issue at this time. This is a daily chart of the Wilshire 5000 which is the entire US stock market. US stocks managed to break out of a trading range (green highlight) that started right around the first of the year on what I consider unimpressive momentum. We'll see if the market can sustain the breakout and Friday's candlestick was a positive but my intuition tells me we may not maintain these levels in the short term. 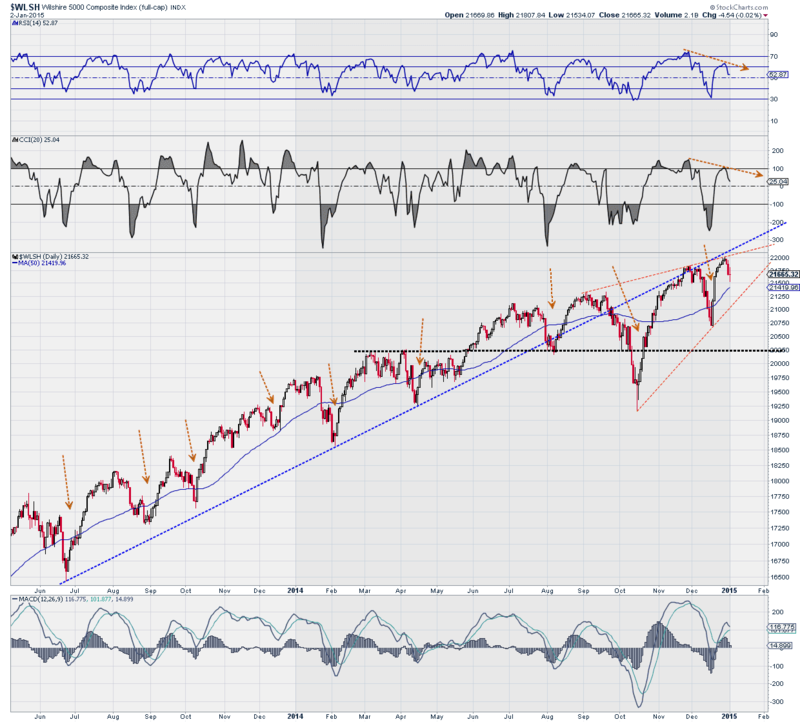 I suspect we'll retrace Friday's price action back below the break out (brown line) on Monday. 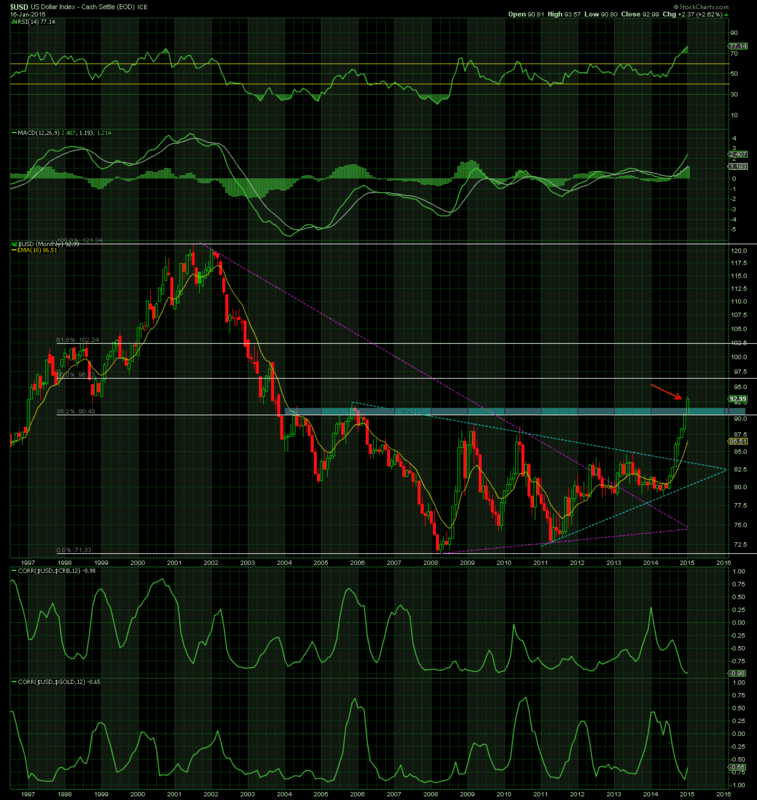 The dollar is forming a less than perfect bullish ascending triangle which usually means a break out to new highs. However, the Relative Strength Indicator (RSI) in the top panel has weakened considerably which makes me think the dollar could fall out of the triangle to the downside. This would be a catalyst for equities and commodities in the short term and would serve to mitigate disinflationary and deflationary pressures in the global economy. 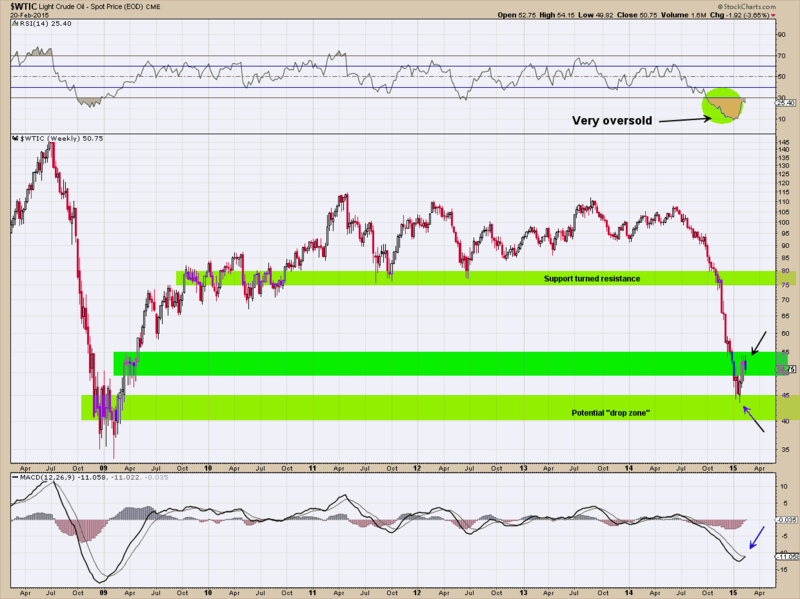 Here's an update of a chart I've posted many times before of the Ten Year Treasury yield. 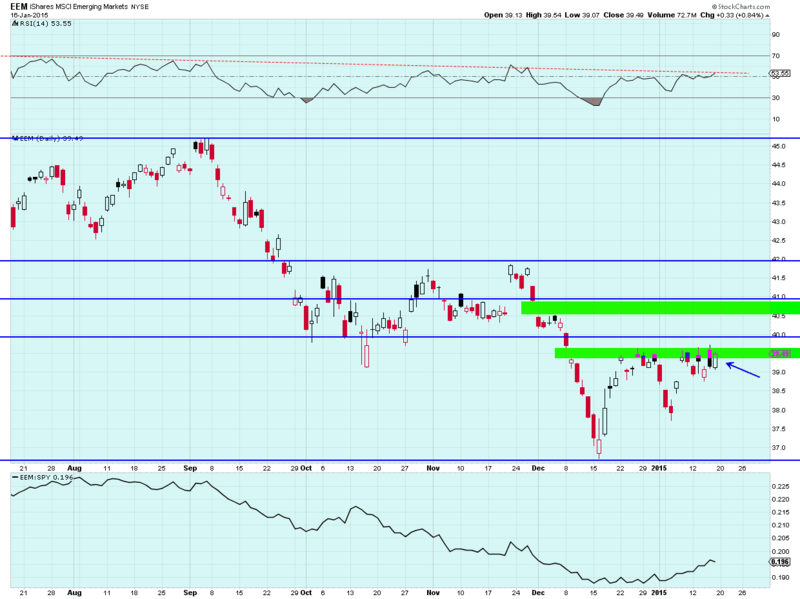 Since February 2nd, the yield has backed up almost 45 basis points(green highlight)! Treasuries are telling us that while rates are still incredibly low, economic growth is gaining momentum. Now, we've seen this movie before so I wouldn't be surprised if this is a "head fake" and a trend line I drew on the chart above shows we haven't broken trend yet but the spike in yield in a few weeks is impressive. 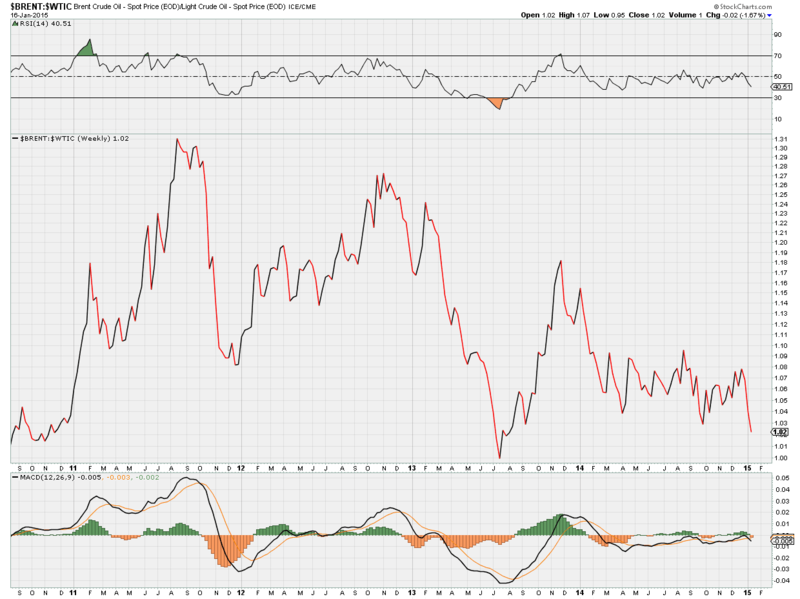 This is the TIP:IEF ratio which is a measure of the market's expectation of where inflation is going. I have posted a more detailed explanation of how the ratio works in past commentaries but for now, if the ratio is rising inflationary expectations are gaining steam and if the ratio is dropping, disinflationary to deflationary expectations are taking over. 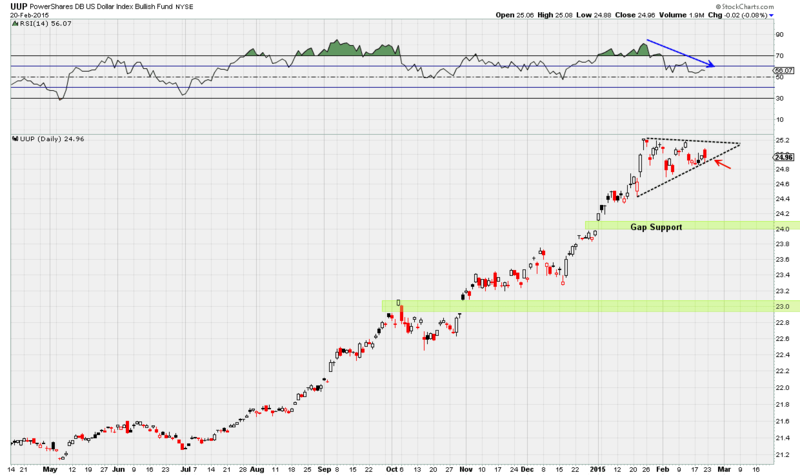 I highlighted where we are now in (green) and we've just bounced in the last few weeks after a sustained descent that started in July 2014. 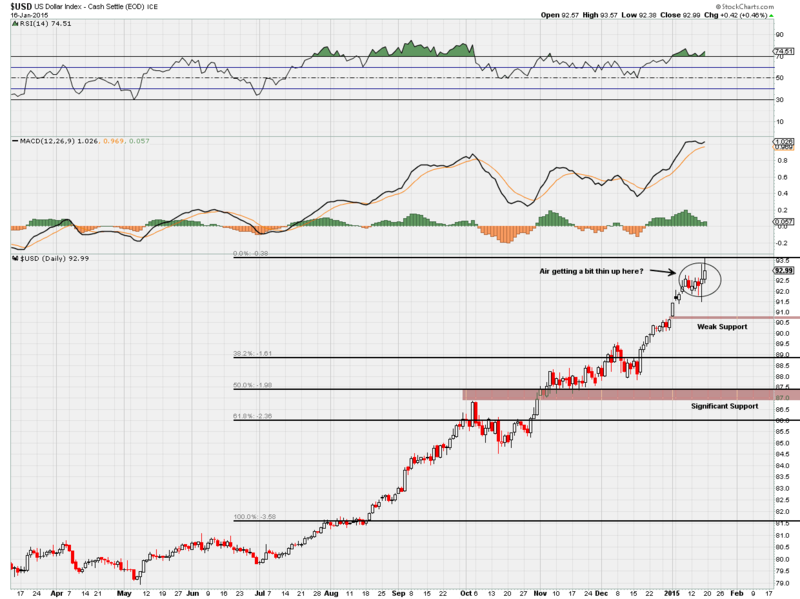 The bounce can be explained by the recent comeback in the price of oil as anything else. 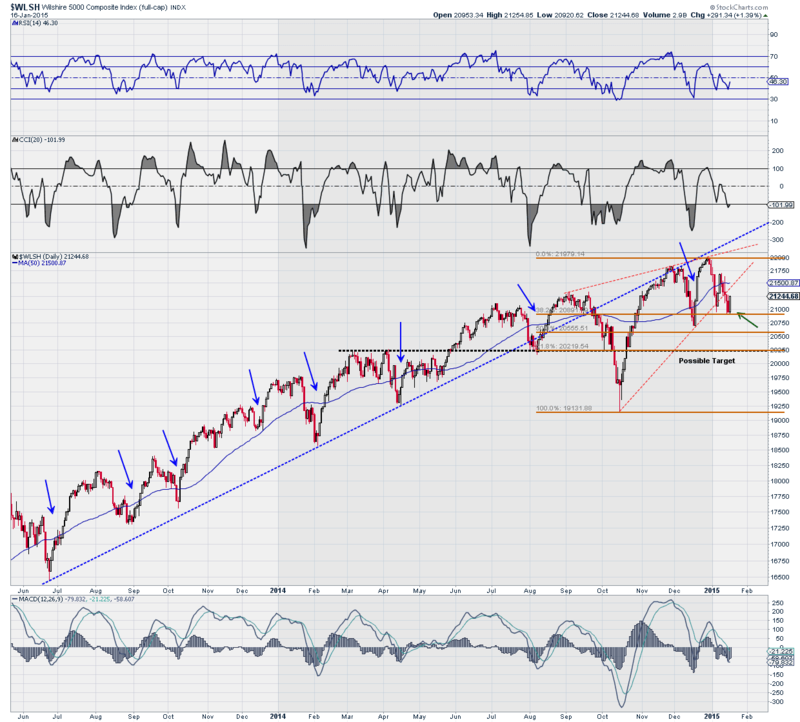 Summing up, I'm constructive on equities going into mid year with a possible slowdown in the next month. The Treasury market is telling us that Greece is a non event and that global economic growth is turning positive. 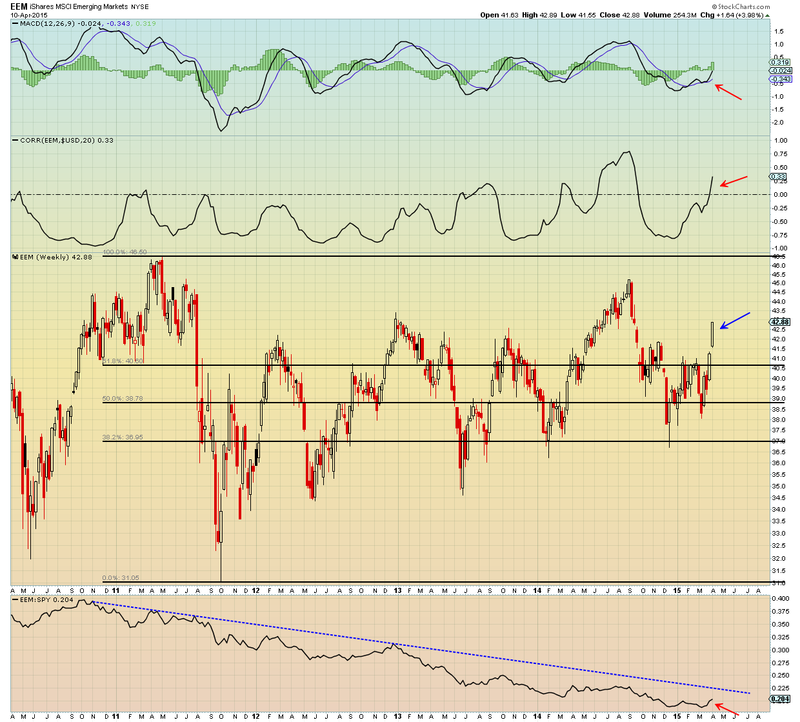 If we get some continued traction in the Euro zone we could be setting up for another banner year in equities. 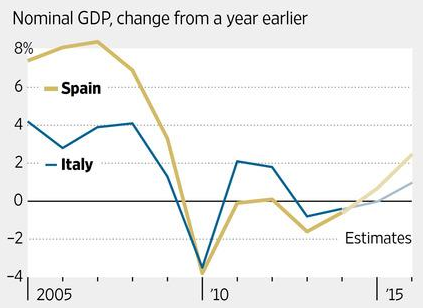 But as I've harped on in previous commentaries, Europe is the key to the global economy truly turning the corner. Certainly, there appears to be movement into European stocks as evidence that the reflation trade is starting to take hold over there. I'll be watching for signs of life in Emerging Markets next. 4. Ongoing disinflationary and deflationary pressures in the global economy. The stock market tends to be a much more emotional market than the global bond and currency markets. What I mean is that one may glean much better directional signals for stocks by watching currencies and bonds. These two markets are the "dog that wags the tail (stocks)". 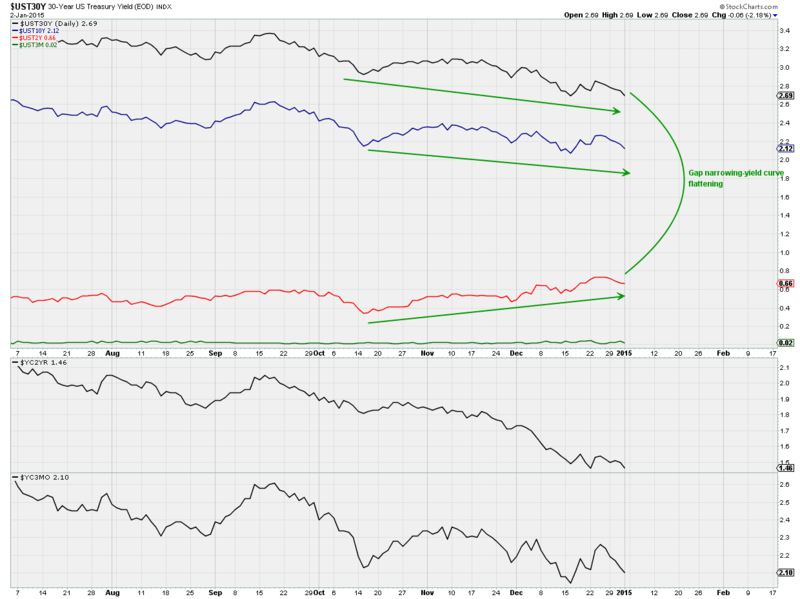 And it's these two markets, particularly bonds, which I'm going to focus on in this brief commentary. I've highlighted the widely identified triple bottom everyone is talking about as well as what is looking like a triple top (thick purple dashed line) that repelled the S&P on Friday, February 6th (blue arrow). We're clearly in a trading range but what's notable is that the S&P 400 Mid cap Index made a new all time high on Thursday, February 5th and Small Caps as measured by the Russell 2000 and the S&P 600 Small Cap Index are outperforming their large cap brethren in the S&P 500. This is a sign of internal market strength and a reflection of the market's perception that large caps, most of which have international exposure, will be negatively impacted to some extent by a stronger US Dollar. The daily chart above details the yield on the Ten Year US Treasury Note and it gives a history of the Ten Year yield going back to 2008. As can be seen, yields are still at historic lows for reasons I've articulated many times in past commentaries but my point is that the spike in yield highlighted above with the black arrow tells me there's no fear over any issues related to Greece. If things get dangerous over there you will see this yield and all yields along the Treasury yield curve drop like a rock. Then you can start worrying! The Treasury market is telling us there is no fear in the global financial system. The bounce we got in oil prices over the past week has helped to stabilize equities as disinflationary trends have been mitigated (at least for now). Inter market relationships are by no means definitive at this point as certain markets are moving according to their respective supply/demand fundamentals (oil), while Gold is more in inverse "lockstep" with the US Dollar. Stocks and the US Dollar have been generally positively correlated for some months now which is signalling a continuation of normalcy: the value of a nation's currency is in direct proportion to it's economic and financial health. If someone had asked me a week ago where stocks were headed I would have told them that there was a good chance we were lining up for a serious correction. But the Treasury market and the charts above tell me that is not in the cards. 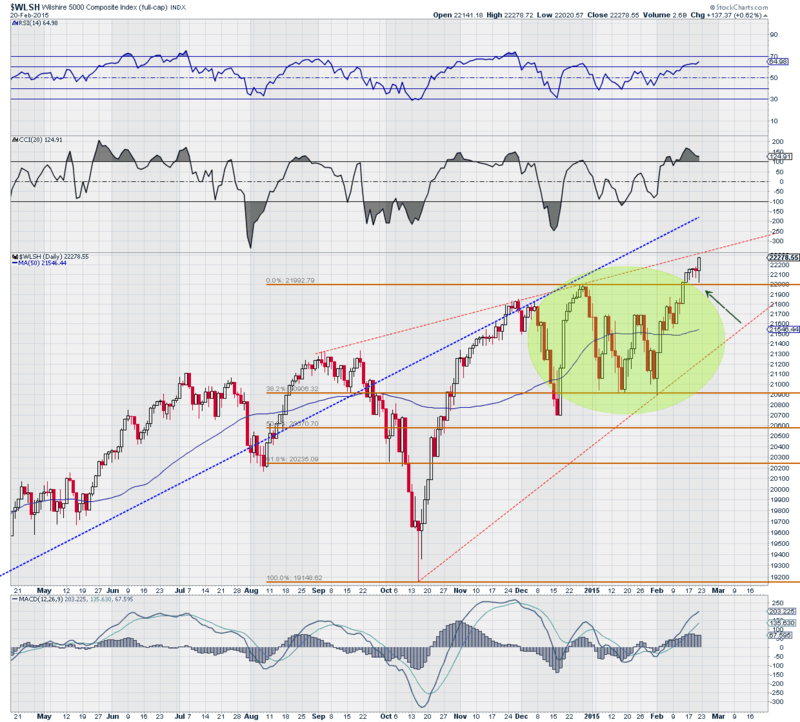 Still, there will need to be a catalyst to shake stocks out of their obvious trading range in the first chart above. 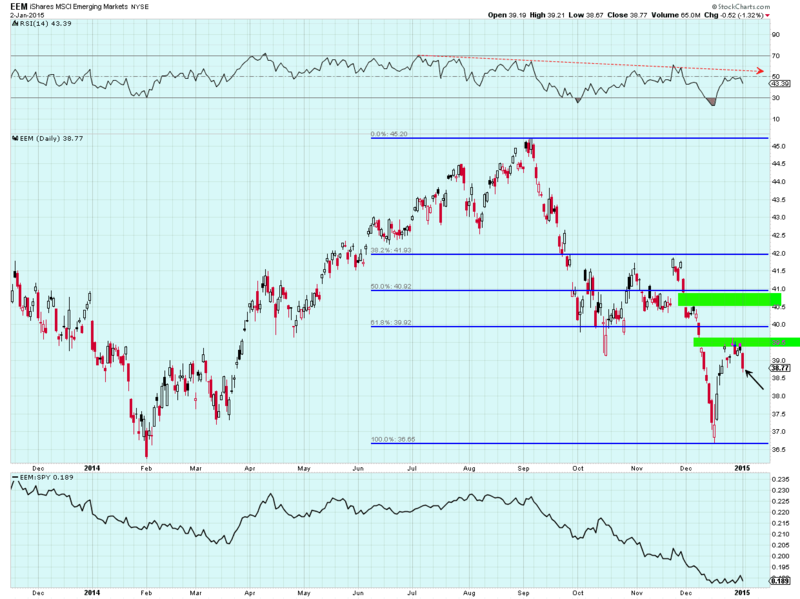 Perhaps, Greece and the EU settling their differences could provide such a catalyst for stocks. So, watch Treasuries! They will tell us where equities are going. As we commence a new year, stocks still hover at all time new highs and while cracks seem to be forming in the market there is still no indication that any type of significant correction (over 20%) is on the horizon. The chart is instructive in that it identifies a series of short term corrections (tan arrows) that punctuated the inexorable rise higher. 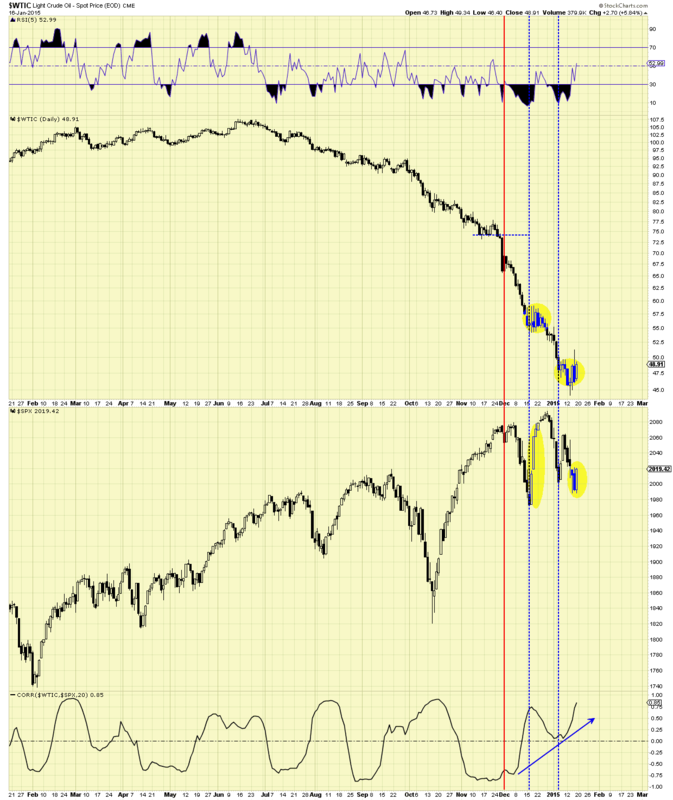 In spite of successive new highs momentum indicators have deteriorated (top two panels above the chart) and with the October down draft we broke a long term uptrend line (blue dashed) that started in July 2013. The subsequent rally to new highs and then the December weakness has created an "ascending triangle" (tan dashed lines) which is a bearish formation. Nevertheless, the size of the triangle and the time it's taking to form suggest that, even here, any pullback will be relatively shallow. Discussions and decisions are being made in the policy rooms of central banks which will have profound consequences for all financial markets in 2015 and in the meantime is wreaking havoc with traditional inter market relationships that have prevailed in some cases for up to almost eighteen years! Let me lay a foundation for the rest of the commentary by making a statement everyone already knows: the entire bull market in equities over the past six years has been predicated on central bank largess; the deliberate inflation of risk assets in order to buy time for the global economy to heal after the loss of tens of trillions of dollars in wealth as a result of the 2008-2009 crash. That regime has now ended in this country and the Federal Reserve is actually preparing to start a tightening cycle by reversing their zero interest rate policy (ZIRP) by raising short term interest rates. In a global economy where the US Dollar is the reserve currency this can be problematic if other economies are not in a recovery phase of their business cycle. And frankly, at this point, no one is but us. Above is a daily chart of the iShares MSCI Emerging Market ETF (EEM) and you can see that while US stocks fully recovered from the nasty October down draft, emerging markets stocks did not and they were turned away from gap resistance last week in the midst of our "Santa Claus" rally. This is all the result of a stronger Dollar. The reason for the Dollar rally is simple enough. While we have completed our monetary easing cycle in this country it is apparent that the other two countries whose currencies make up the majority of the Dollar Index are just starting their easing cycles. The Japanese Yen, which makes up 13.6% of the Dollar Index is literally being trashed by a quantitative easing program which proportionally speaking, dwarfs the Fed's easing efforts of the past six years. And now, with the possibility that the European Central Bank (ECB) is finally going to do what they have to in order to expand their balance sheet to facilitate easy credit conditions, the Euro, which is 57.6% of the Dollar Index, is precipitously dropping, possible to parity (one to one) with the US Dollar. Because global central bank policies cannot synchronize policy, technical distortions are starting to manifest themselves in the market, turning traditional inter market relationships on their head. And yet, with global commodity prices still dropping which is the classic sign of weak economic conditions, the Fed is preparing to raise short term interest rates! And why is this happening? With so much slack in the global economy and the prospect of rising interest rates in the US, global money flows are still reaching for "safe yield" and Uncle Sam's debt is the safest place to park your money in a world where most economies are flirting with economic contraction. And so, divergent policies emanating out of Japan and the US and a stubborn Europe which seems unable to make a commitment which would create the necessary conditions to facilitate global growth are creating a tension which must be unwound. We may start to see the unwinding later this month when the European Central Bank meets on January 22nd. The expectation is growing in the market that the ECB will be compelled to start sovereign bond purchases in the market in order to ease credit conditions in the Euro zone. While I still have my doubts on whether this will occur, others who I greatly respect think that some sort of sovereign bond purchase program will be announced after the meeting. I had the opportunity to interact with Marc Chandler, Senior Vice President and Global Head of Currency Strategy at Brown Brothers Harriman in New York on line a few days ago, and he believes the ECB may elect a 500 billion euro program in which the national banks carry the debt on their balance sheets rather than the ECB; a policy that would appease the Germans (somewhat). I believe that the results of the January 22nd meeting in Europe will have a determining effect on the direction of equities in 2015. With a Federal Reserve ready to raise interest rates in this country, a sovereign bond purchasing program in the Euro zone would fit "like a glove" to soothe the tensions both in the global economy and in the financial markets. The fundamental ramification of such a policy decision would be the expectation that global economic conditions would start to normalize, allowing the rest of the planet to commence growing as Europe starts consuming again, thereby providing the catalyst for growth in the emerging economies of Asia and the Pacific Rim, regardless of a strengthening dollar. Whether this expectation is ultimately viable without structural economic reforms in the Euro zone is irrelevant to the markets over the next year. Remember the simple formula: the emerging markets and China, being primarily export driven economies, are held captive to the consuming economies of the developed world (US & Europe). With a firm commitment in the Euro zone to truly implement a significant monetary easing program, I believe emerging market economies and their stocks would take off to the moon! Moreover, I predict another year for US equities similar to 2013, where the S&P500 returned north of 29% for the year. So, given my grand thesis articulated in this commentary, how can China be rallying when the rest of the world, save the US, is floundering? A simple answer: Chinese government stimulus. In a deflationary environment and with an economy that is still export based (regardless of the desires of Chinese officials for a consumer based economy which is still years away), the economic numbers coming out of that nation are either flat or in contraction territory which is just what we would expect in a world still dominated by the consuming economies of the west. What would change my mind about China? 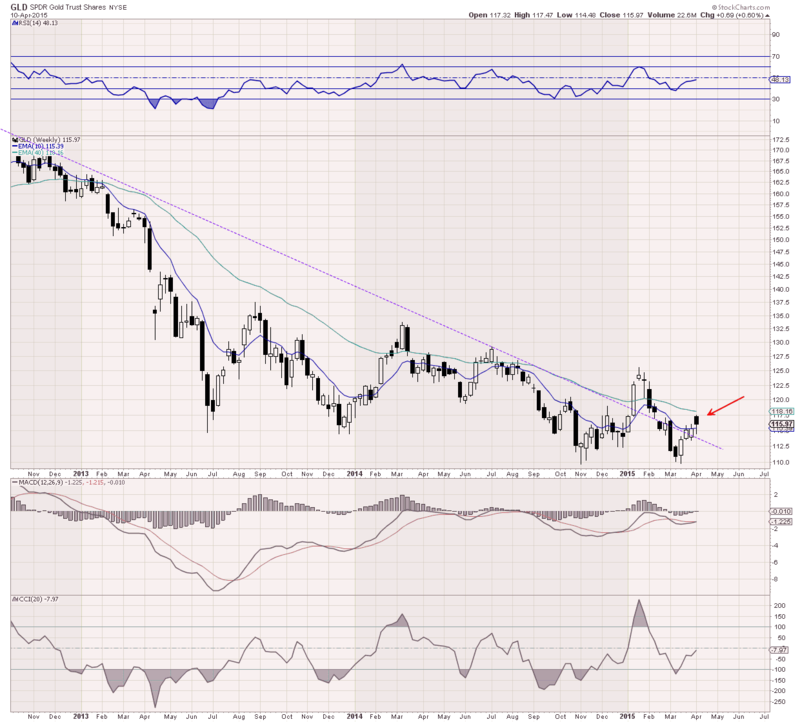 A breakout on the weekly chart above would compel me to rethink my thesis not only on China but my grand thesis on what will be moving our markets in 2015. So the outcome of the ECB meeting on the 22nd and the details of any sovereign bond purchase (if there is one) will be pivotal to the market's reaction, either good or bad. With the Fed ready to raise interest rates in the world's reserve currency, any indication that the ECB is waffling or holding back will precipitate a world wide sell off in equities with emerging markets and China taking the brunt of the beating. And this is why volatility is starting to enter equity markets (along with over-bought conditions and unbalanced sentiment readings). We'll see what happens on the 22nd! Have a great week!